Belltown Pizzeria has been in business at the same location since 1994. Two brothers, Tony and Benny Califano, came from Ponza, Italy and had a vision to open up a restaurant together. Benny mastered the art of making pizza at the age of nineteen and Tony, at age twenty-three, had a talent for creating great tasting dishes. The brothers wanted to share their Italian heritage of creating dishes from scratch with others. 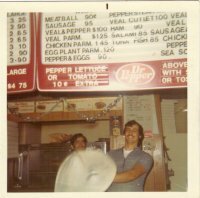 They first started Stamford Restaurant & Pizzeria in 1972. After much success, Tony and Benny decided to expand their business in 1994 and open Belltown Pizzeria. The Califano families continue to help run both establishments and while keeping their customers fully satisfied.